Peru's Sacred City of Caral-Supe, the oldest centre of civilization in the Americas, was inscribed on Unesco’s World Heritage List by the World Heritage Committee, chaired by María Jesús San Segundo, the Ambassador and Permanent Delegate of Spain to Unesco. The 5000-year-old 626-hectare archaeological site of The Sacred City of Caral-Supe is situated on a dry desert terrace overlooking the green valley of the Supe river. It dates back to the Late Archaic Period of the Central Andes and is the oldest centre of civilization in the Americas. Exceptionally well-preserved, the site is impressive in terms of its design and the complexity of its architectural, especially its monumental stone and earthen platform mounts and sunken circular courts. You will be picked up from your Hotel at 6:00 am. Then we will board a private vehicle and will drive to the north of Lima towards the lost city of Caral. We will drive our vehicle for approximately 3 hours till the Kilometer 184, before reaching the village of Supe. Then we take a detour on a dirty road driving along the left bank of the Supe River till the ruins of Caral. Once in Caral, we will start a walking tour with our local guide. During our excursion we will see the zone known as Sacred Fire, a little temple in which fireplace where found remains of coal, bones, seeds and quartz. 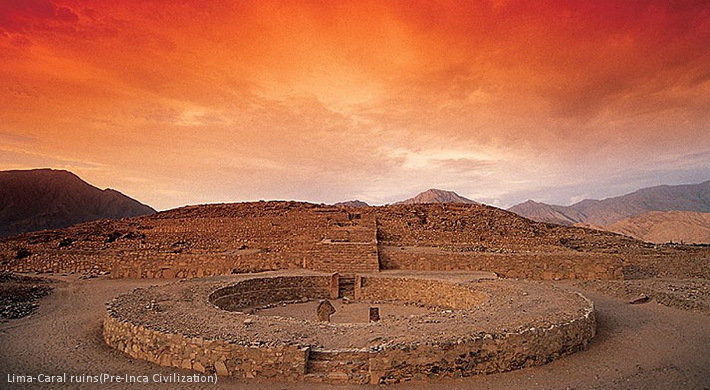 Later on we will see one of the most outstanding buildings of Caral known as the amphitheater, where lies a circular plaza with ceremonial features, where archaeologist believes the men of Caral carried out religious ceremonies. Later on we will reach the Greater Pyramid, a strikingly large building located in a dominating position within the urban plan of Caral. It is said that officials standing on the highest part of this pyramid could monitor not only the activities going on the city, but also a large part of the capital area in the middle valley. At the site was found the corpse of a young man who was probably sacrificed in honor to local gods. Archaeologist also discovered walls decorated with small figures and collars made of shark teeth. It is believed that the Great Pyramid was the most impressive public building and also was the center of the political, administrative and religious power. From one side of the pyramid our visitors will be able to make out the green Valley of Caral that lies just behind the pyramid. Following our tour, we will reach the pyramid called Huanca, a small building overlooking a mysterious monolith. Archaeologists believe that this monolith was used for astronomical and ceremonial purposes. Afterwards we will provide you a box lunch. Finally we will take our private vehicle to return to Lima. We will be back in Lima around 16:30 hrs. Transfer to your hotel.